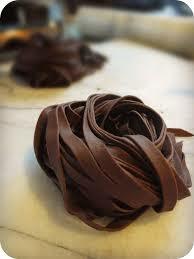 This is not at all sweet – chocolate adds depth to the flavour of the pasta. The pasta goes well with wild boar Ragù (or in South Africa use wild boar or warthog) and sauces made with gamey meats. You could even pan fry a fillet steak to rare, use the sauces and thin slices of the steak as a sauce. 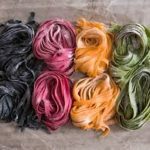 Alternatives include a tomato and chili sauce or a sage and butter sauce or a walnut sauce. Make a well with your flour as in the picture; break the eggs into the well and add your powdered cocoa. 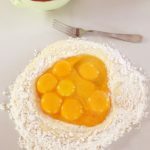 With a fork beat the eggs together until combined and then start incorporating some flour into the eggs, a little at a time, until the eggs are no longer runny. Put the fork aside and get ready to use the palm of your hands until the dough is well mixed. Remember from your classes that you might not need all of the flour so push some of it to one side as you can always add this in if needed. When you feel that the dough has reached the right consistency, sprinkle the dough ball with flour and wrap with cling wrap and refrigerate up to 24 hours, but 15 minutes is also more than enough time for resting.